Make a statement with a unique wedding ring from deBebians. We have lots of traditional wedding rings from which to choose, including plain gold or platinum wedding rings, diamond wedding rings and lots more. Today, I want to talk about some unique wedding rings that we offer. Many customers aren’t being matchy-matchy anymore and are choosing a more unique wedding ring. 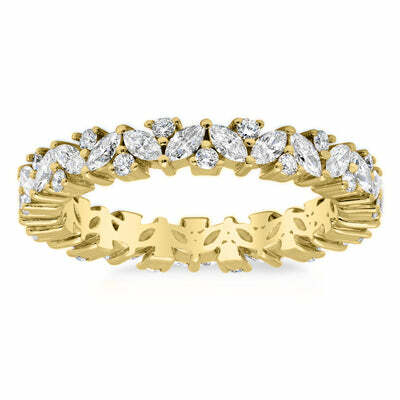 This is our ever popular marquise and round diamond eternity ring with 1.00cttw diamonds. Known by us as the ‘Laurel Eternity Ring,’ this is by far one of our best selling unique wedding rings. Lately, we have even modified it for a few clients to be ½ way around. 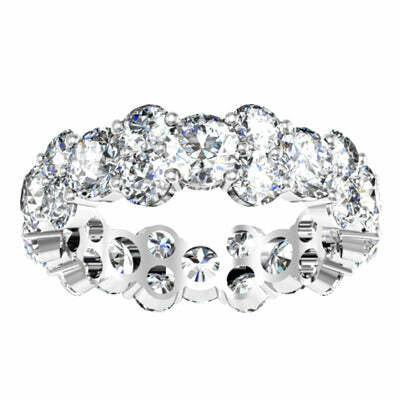 Perhaps my most favorite unique wedding ring is this round brilliant cut diamond eternity ring with 4.50cttw round diamonds. This was a top contender when I was choosing my wedding ring. I ended up choosing a different ring (a radiant east west eternity ring), but mostly because the center stone on my engagement ring is a radiant cut diamond. Maybe one day I’ll get this as a right hand ring! My 40th IS just around the corner… HINT HINT! 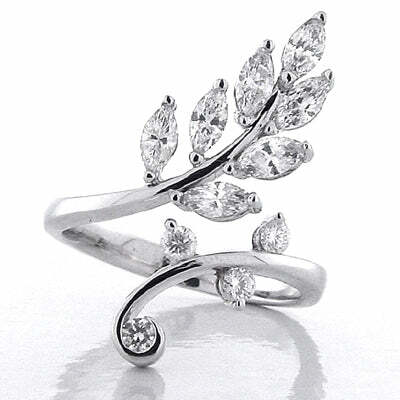 For all those nature lovers, how about this diamond leaf ring? This unique wedding ring features 0.60cttw of marquise and round diamonds in an open leaf-like pattern. You really can’t get much more unique than this wedding ring! If you are looking for a unique wedding ring, look no further. With so many unique wedding ring designs available on our site, if you don’t see what you have in mind, we can help you create it! Call and speak with one of our gemologists or jewelry designers. Happy shopping!